Tesco has announced that it is scrapping the ‘Clubcard Deals’ branding from next week replacing it with ‘Clubcard Boost’. It will effectively see the current ‘deals’ and ‘exchange’ schemes – the latter allowing you to swap your vouchers in store for category-specific coupons – merged under one banner. The biggest change will be with the (ex) ‘Exchange’ scheme. The plan is that this will now run all year round, with different categories being promoted every month. The first batch of categories will be Clothing, Baby and Toddler, Cosmetics and Fragrance, Cook and Dine and Home (pots, pans etc) and Tesco Opticians. 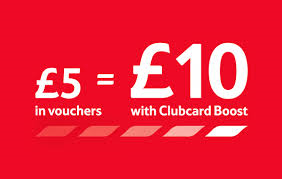 For the next month, you will be able to exchange a £5 Clubcard voucher for a £10 in-store voucher. The new Clubcard Boost website will be here from Monday. Let’s see what happens.